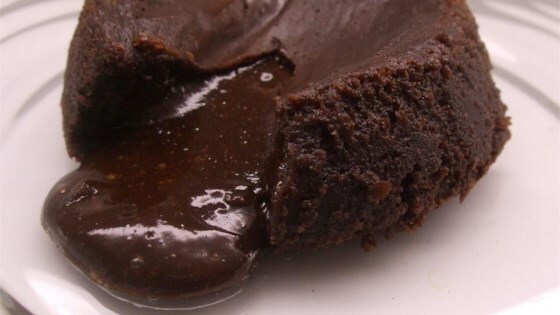 "Dessert is individual molten chocolate cakes. They're simple and elegant, and they bake in under 10 minutes in a standard muffin pan. The best part about these little beauties is that the cake batter is extremely forgiving: You can make it up to six hours before you plan to serve the cakes. Fill the pans with batter and refrigerate, but remember to remove the pan far enough in advance of baking to let the batter return to room temperature. Because they bake for only 8 to 10 minutes, pop these little cakes into the oven as you're clearing the main course dishes and making coffee."